Established in the year 1949 (April 23) the Department of Geology at the University of Dhaka started its graduate programme (BSc Pass) with the prime aim of disseminating geoscience education and technology and thereby providing trained geoscientists to be engaged in the profession of geological mapping, surveying, exploration, extraction/ production and management of country’s natural/mineral resources. The application of this knowledge thus contributes its share in the national development. To fulfil the increasing demand of professional geoscientists, curricula leading to MSc and BSc honours degrees were introduced in 1957 and 1967 respectively. Until now the Department remains the largest academia in the country that offers state-of-the-art geoscience education. The Department of Geology presently offers degrees in Bachelor of Science (BS) with Honours, Master of Science (MS), Master of Philosophy (MPhil) and Doctor of Philosophy (PhD) in Geology. The Department also offers minor courses for Honours students of other departments. The BS (Hons) is a four-year integrated programme consisting 126 credit hours of theory, practical, field mapping, project and viva voce (oral) courses as majors and 20 credit hours of physics, chemistry and mathematics courses as minors. The MS degree is a one-year programme based either on course work (Group A) or on course work along with research (Group B). The MPhil is a two-year programme of course work and research. The PhD programme essentially involves research work. The Department enrolls 50 students in each academic year as first-year honours students. The Department presently has 23 academic staff with wide range of research interest and expertise. Good laboratory facilities are available in the fields of Sedimentology, Petrography, Optical Mineralogy, Paleontology, GIS & Remotesensing, Geochemistry, Structure & Tectonics, Seismology, Geodesy, Geo-resource Exploration, Geohazards, Geotechnical Engineering, Geophysics and Hydrogeology within the department. The Department also undertakes collaborative research programmes with other departments and institutions like Geological Survey of Bangladesh (GSB), Bangladesh Oil, Gas and Mineral Corporation (Petrobangla), Bangladesh Water Development Board (BWDB), Bangladesh Atomic Energy Commission (BAEC), Department of Public Health Engineering, Bangladesh University of Engineering and Technology (BUET), Bangladesh Petroleum Institute (BPI) and other Non Governmental Organizations. The Department also maintains liaison with geology departments of other universities home and abroad. The Department has a museum, named after Shaheed Md. Abdul Muktadir, a martyr of liberation war, who was a faculty of the Department until 1971. The museum has quite a large collection of fossils, minerals, rocks, models, maps and charts. The museum is used as a teaching laboratory for Mineralogy, Crystallography, Petrology, Paleontology and Structural Geology courses. The departmental seminar library has a modest collection of books, journals, geological and topographic maps, aerial photographs and satellite imageries. The library provides reading facility only for the students. Students of the Department have to take a field mapping course in a geologically suitable area (Chittagong, Chittagong Hill Tracts and Sylhet) in Bangladesh every year during BS (Hons) and MS courses. Standard field equipments including geological hammer, survey apparatus, clinometer, Brunton pocket transit, hand GPS, range finder, altimeter, binocular, etc. are available for fieldwork. The duration of the fieldwork is 4 weeks spread over 4 academic years in BS (Honors) and 2 weeks in MS levels. The Department has a good number of IBM compatible PCs which provide support for research in the field of Remote Sensing, GW Modelling and other geological applications. Recently, the Department has established a computer-based GIS laboratory equipped with Scanner, Digitizer, Laser Printer and more PCs. The department has a drafting section equipped with necessary cartographic and drafting gears. The section provides necessary support to the students in preparing base maps and geological maps for field work. The section also provides cartographic services in research activities of the department. The Delta Study Centre, a centre of excellence for advanced research in the field of Bengal delta, was established within the framework of the department in 1991. The centre is equipped with moderate computer facilities. The centre also provides research grant for the students to undertake MS research in the above mentioned fields. The Department of Geology has also an informal research group known as Geohazard Research Group (GRG) consisting of faculty members to promote advance research pertaining to the Geoenvironmental Hazards. Bangladesh having situated in an active tectonic region bears, by and large, a character of earthquake prone. The present seismicity and tectonic setting envisages that about 60% of the country falls in high risk zone. The Department of Geology of Dhaka University has initiated an extensive research on earthquake and crustal dynamics in collaboration with Lamont-Doherty Earth Observatory (LDEO) of Columbia University in New York, USA since 2000. The department is housed with the state-of-the-art technology for monitoring earthquakes and three dimensional crustal deformations know as ‘Dhaka University Earth Observatory (DUEO)’ established in February 2003. The observatory is equipped with digital broadband seismograph and Global Positioning System (GPS). DUEO is a Foreign Affiliate Member of ‘Incorporated Research Institutions for Seismology (IRIS). DUEO is a consortium formed in co-operation with Rajshahi University, Khulna University, Chittagong University, Chittagong University of Engineering and Technology (CUET), Patuakhali Science and Technology University (PSTU), Shajalal University of Science and Technology (SUST). Dhaka University Earth Observatory operates network of 6 permanent seismic stations, 6 portable seismographs and 18 continuous geodetic GPS stations in the country. 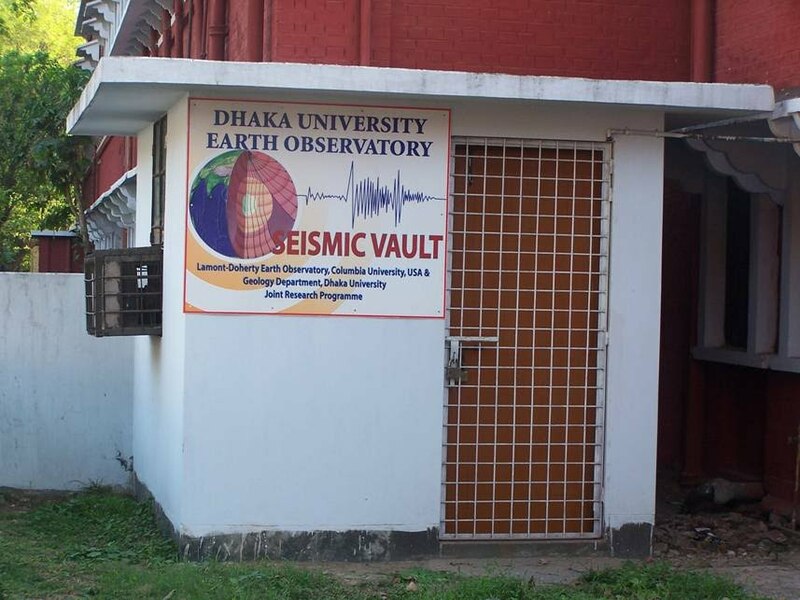 The objectives of the Observatory is to carryout research on crustal dynamics, plate motions and to monitor the seismic activity in Bangladesh and surrounding countries, as well as to disseminate information of earthquakes to the government and the public. Data is open to scientific community. 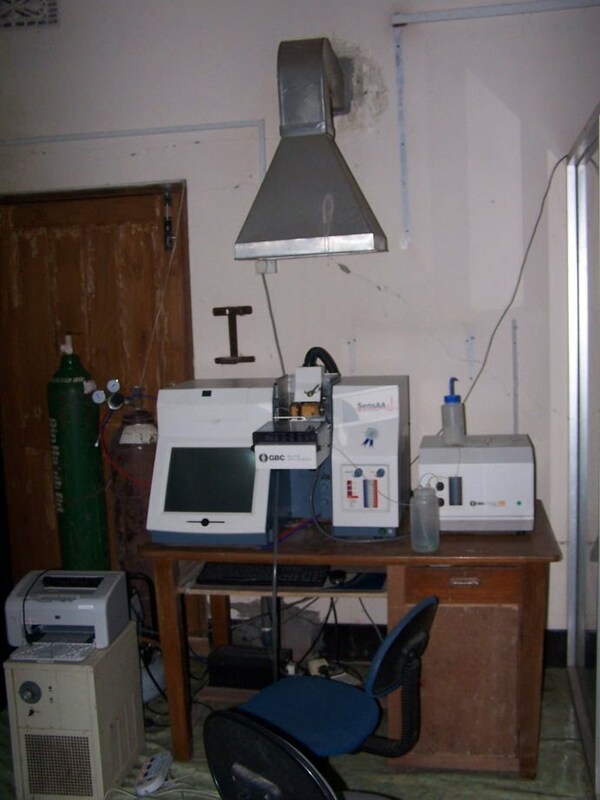 The lab is equipped with Atomic Absorption Spectrometer (AAS), Ion Chromatograph (IC) UV-Visible Spectrometer, Flame photometer, Total Organic Carbon (TOC) analyzer to conduct research for the postgraduate students in the field of hydrogeology and environmental geology focusing environmental pollution, groundwater contamination, water quality assessment and management of groundwater resources. 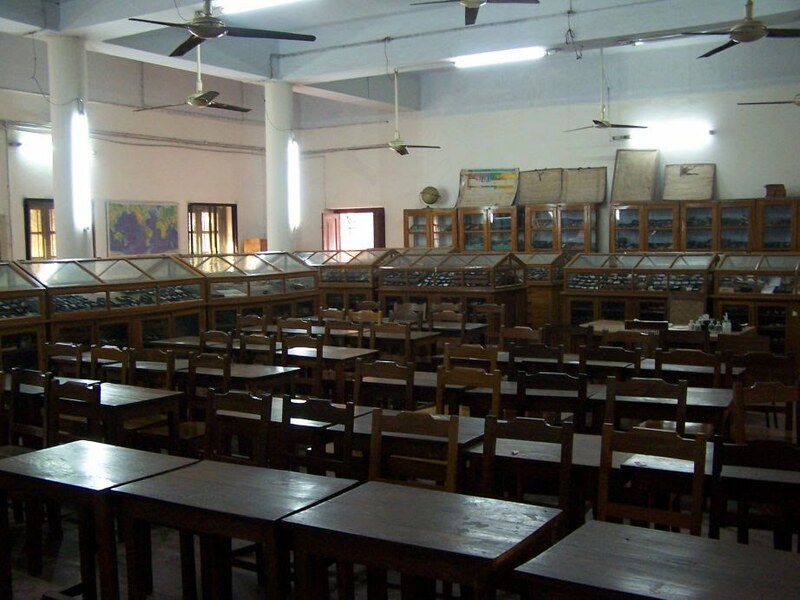 This laboratory was established in 2006 with significant funding support from Columbia University, NY and Geology Department of Dhaka University. The lab houses 20 high performance Desktop PCs build into a Local Area Network through a Server that hosts the floating licenses of ArcGIS software. Currently the lab is using the 9.2 version of this software. Both ArcGIS and Erdas Imagine software are used to teach the 4th year students fundamental courses in Remote Sensing and GIS. The MS students engaged in thesis research also uses this lab to facilitate spatial data interpretation relevant to their research topics. Faculty members also makes good uses of the lab facilities in their research projects creating and analyzing GIS data and digital processing of satellite imagery. This laboratory will be housed in a dedicated room in the new 1st floor wing of the department once the construction is completed. 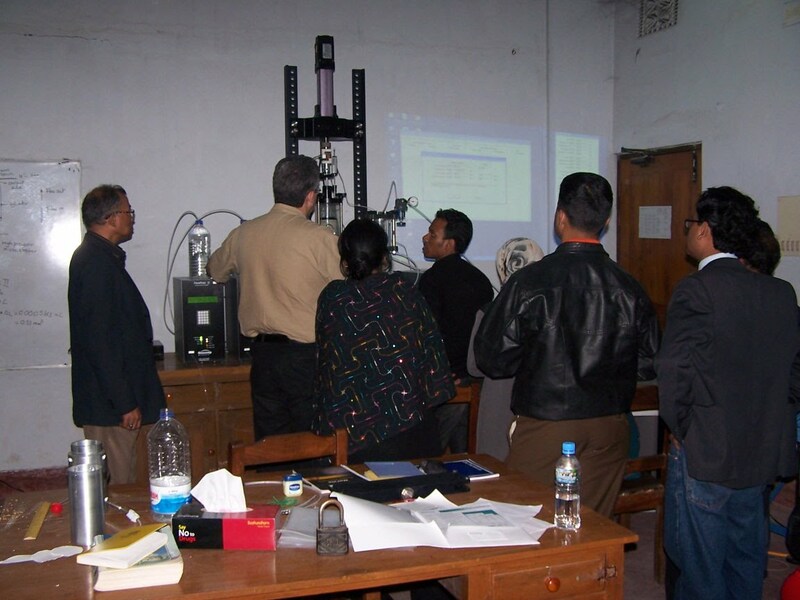 The Geology Department of Dhaka University has a Geological and Geotechnical Engineering Laboratory equipped with the most technologically advanced testing equipment. The laboratory has Fully Automated Cyclic Triaxial Testing Equipment, Universal Triaxial Testing Equipment, Direct Shear Testing Equipment, Consolidation Testing Equipment, PS Logging Equipment. All these equipment have been donated by the European Commission (EC) through United Nations Development Programme (UNDP) under the Earthquake and Tsunami Preparedness Component of the Comprehensive Disaster Management Programme (CDMP). TheCyclic Triaxial Testing Equipment is used for earthquake research to evaluate the liquefaction potential of the subsurface geological materials subjected to earthquakes that include an evaluation of the dynamic strength of the soil under the foundations of the civil engineering structures. Universal Triaxial Test and Direct Shear Test Equipment are used to determine the shear strength parameters such as internal friction angle and cohesion of geological materials. The shear strength parameters are essential for the foundation design of the civil engineering structures, such as building, road, bridge, tunnel, etc. These parameters are also necessary for slope stability analysis of mines and road cut in hilly region. The Consolidation Test Equipment is used to evaluate the consolidation or settlement characteristics of geological materials. Differential settlement under the foundations of civil engineering structures can cause foundation failures. The PS Logger is used to determine the shear wave velocity of the geological materials upto the depth of engineering bed rock. The shear wave velocity is important for the preparation of engineering geological map which is used in seismic (earthquake) hazard and vulnerability assessment. This laboratory was established in 2008 supported by Schlumberger. Schlumberger donated industry standard Software -"Petrel" for Seismic to simulation workflow along with two high end workstations. This software is used for 2D/3D Seismic Visualization and Interpretation, Geological modeling, Reservation characterization and Reservoir Simulation. Training, support to the research students and faculty members are provided under University-Industry collaboration with assistance of Schlumberger. The MS students use this advanced lab for their research work which helps them to enhance their capability for career in Industry and Research. Faculty members also make good use of the lab facilities in their research projects. Students of the department actively participate in the Departmental and interdepartmental indoor and outdoor events of games, sports and other cultural activities regularly. The department has two trust funds named ‘Parvez Smriti Scholarship,’ and ‘Prof. Muhammad Abdul Hai and Prof. Manzoor Hasan Scholarship’ offering scholarships to the students securing the highest CGPA in B.S (Honours) and the highest GPA in 3rd year (Honours) final examinations, respectively. There is another fund named 'Mohammad Shah Alam Mojumder Trust Fund' awarding gold medal to the student(s) securing the highest CGPA in B.S. (Honours). On completion of their BS honours degree, the graduates from this department are eligible to join various governments, autonomous, private and multinational organizations. Major governmental and autonomous organizations include: Geological Survey of Bangladesh (GSB), Petrobangla, Bangladesh Petroleum Exploration Company (BAPEX), Bangladesh Water Development Board (BWDB), Bangladesh Atomic Energy Commission (BAEC) and Department of Public Health Engineering (DPHE). Other national and international organizations where geologists may build up there career are Institute of Water Modelling (IWM), Centre for Geographic Information Services (CEGIS), International Oil Companies (IOCs) and Mining companies. Besides, these graduates may also join the cadre services through open competition conducted by the Bangladesh Public Service Commission (PSC). Fresh graduates also get opportunities to work in the different research projects carried out by the faculties of the department in national and international level. Students with better academic records may also pursue higher studies in the department leading to MS (in specialized fields) followed by MPhil or PhD. After achieving the requisite academic qualification, they may be appointed as faculty in the Universities of the country. In addition, a good number of graduates proceed to overseas universities every year for higher studies.